Honduras is a the second biggest country in Central American, with Caribbean Sea coastlines to the north and the Pacific Ocean to the south that offers great beaches and coral reefs where snorkelling and diving are exceptional by any standard - The most famous diving area are situated alone the Bay Islands, which is part of the second largest barrier reef in the world - The Mesoamerican Barrier Reef. The Bay Islands are nestled in the southwest corner of the Caribbean, about 48 kilometers north of Honduras, consist of eight islands and 53 small cays. The islands of Roatan and Utila in particular feature world-renowned reef systems with sheer walls, mystical wrecks, massive barrel sponges and captivating macro critters. Roatán is the largest of the Bay Islands, it's ideally situated along The Mesoamerican Barrier Reef System (the second longest barrier reef in the world) that extends north of the Yucatan Peninsula and down to the Caribbean coast of Honduras. This extensive reef attracts a wide variety of marine animals, including whale sharks, it is world known for scuba diving. Útila is the smallest of the Honduras' major Bay Islands, located in a region that marks the south end of the Mesoamerican Barrier Reef System. It is more laid back and well known for backpackers looking to become dive professionals. The island also has frequent visits from the gentle giants, Whale Sharks. These waters around the Bay Islands are also home to larger marine species, such as Whale Sharks, Caribbean Reef Sharks, Bottlenose Dolphins and Manta rays. The region has fantastic critter diving with subjects like Electric Rays, Longsnout Seahorses, ferocious looking Spoon-nose Eels, Rough Box Crabs, Yellowheaded Jawfish, Sailfin Blennies and even Southern Stargazers. Diving Season : The larger fishes around this region may be encountered year-round, though the sightings occur most dependably Feb through May (especial between mid February to April for whale sharks), and August through October. Mary’s Place : One of the most famous dive sites off of the south side of Roatan, Mary’s Place has a lush reef with crevasses and tunnels running through it that provide great photo opportunities. Taviana’s Wall : Lots of turtles are found here and this site makes a great night dive with octopus, crabs and lobsters. Wreck of the Aquila / El Aguila : Wreck divers will enjoy this dive site, a 64-metre cargo vessel purpose-sunk as an artificial reef. It rests at 30 metres on a sandy bottom, which is full of garden eels, large Groupers and a big blue Parrot Fish, as well as a big green Moray Eel that is always willing to come out and play. Odyssey Wreck : This freighter is Roatan’s largest wreck measuring 300 feet long, 50 feet wide, and 85 feet tall. It is one of the largest wrecks in the Caribbean. West End Wall : This wall starts great and gets even better as you drift along. Fish cover the top and a variety of sponges and corals cling to the side. Keep a sharp look out into the blue for schools of pelagics including eagle rays. Dolphin Den : This site has a network of tunnels and canyons that takes you from one side of the reef to the other. You wind through an underwater maze, illuminated with natural light filtering through crevices, which starts at 5 metres and exits at 12 meters. The dive site gets its name from a tragic incident when many dolphins became disoriented in a cave and perished. Coco’s Sea Mount : Coco’s beauty is in the mix of coral and good visibility that divers always enjoy. The ocean floor rises from hundreds of feet to only 40 feet from the surface. These sea mounts are far from Utila and Roatan, therefore, they are rarely visited by day boat divers. Black Hills : Located on the southeast end of the island, a favorite among all divers, you can count on seeing schools of Creole Wrasse, Atlantic Spadefish, Horse-eye Jack and Southern Sennets at this seamount, along with Scorpionfish, Toadfish and the rare Frog Fish. A resident turtle appears unafraid of divers, as do the Barracuda. Large pelagic fish can be spotted here, such as Manta Rays, Marlin, and sharks including the big boy himself, the Whale Shark! Duppy Waters : A coral garden begins beneath the boat at 6m, with walls sloping off into the blue. Eagle Rays, stingrays, octopus and schools of Creole Wrasse and Blue Tang are in abundance. CJ’s Drop-off : This is one for the deep dive enthusiast. Spiny Caribbean Lobster, Golden Tail Moray and schools of Jack are plentiful. Raggedy Cay : This popular site begins at 9m and falls away to 40m, with Majestic Eagle Rays swooping by and Hawksbill Turtles munching away on soft corals. Octopus can be found around the sand channels along the coral garden as well as Spotted Morays. Old Bank : This is a very nice shallow dive site, where the rare Elkhorn Coral flourishes and smaller critters, like the Fringed Filefish and Caribbean Reef Squid, can be seen along the walls. In the sandy areas, the allusive Yellowhead Jawfish can be spotted peering out of its hole. Cannery Bank : Here’s a prime opportunity to witness large pelagic fish that roam the open waters. There are logs of vibrant color on the mounts, beginning at 7.5m and sloping to 33.5m. Jack Neil Point : Sand, walls and individual coral heads make this a must dive. Long snout Seahorse, Large-eye Toadfish, Flying Gurnards, and octopus make this one of the area’s best night dives. Halliburton Wreck : Sunk in 1998 as an artificial reef, it was 30m long supply vessel lies in 30m below the surface. 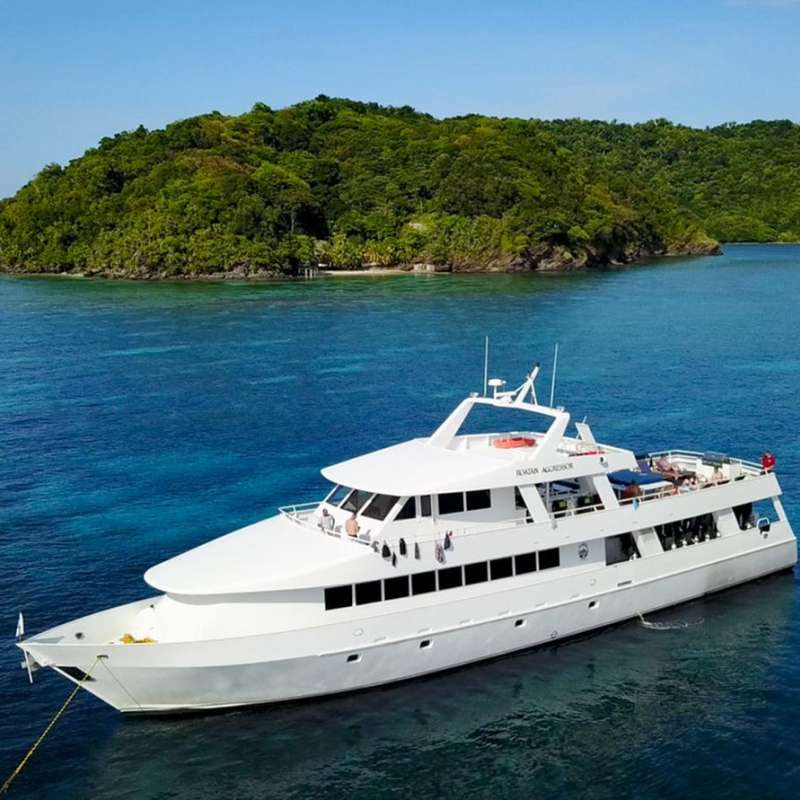 Green Morays, Spotted Drum, Yellowline Arrow Crabs, Channel Clinging Crabs and Bearded Fire Worms are usually seen on this exceptional deep dive, as well as the occasional Porcupine Fish and Pipefish. Halliburton Bank : This seamount beginning at 12m and sloping down to 24m. Bluebell tunicates are in abundance, and the rare Fingerprints can also be found. A resident Hawksbill turtle gives the site its name. Toon Town : Known for its macro life, this dive off Cayos Cochinos is jam-packed with big clumps of bluebell tunicates, small crabs and flamingo tongue cowries, among a long laundry list of headliners from the tinier marine kingdoms. Pelican Point : Every kind of reef fish imaginable, including French and queen angelfish, butterfly fish, tangs, and parrotfish. On the outside of the reef, you may see sharks and barracuda patrolling. L'excellente visibilité melee aux eaux calmes, chaudes et limpides ont fait des îles Caiman une destination de premier choix dans la Mer des Caraïbes. Le Cayman Aggressor 4 explorer les plus beau tombants et épaves de Grand Cayman, Little Cayman et Brac avec 18 plongeurs maximum à son bord.